Welcome to another video from our friends over at SUPboarder. This time Rueben and Will are reviewing the Red Paddle Co Compact 9’6″. A revolutionary board in the iSUP world. It introduces not seen before compactness, lightweight, technologies and possibilities. Half the size, double the adventure as Red Paddle Co say. Let’s see if this is the case. Hi there, welcome back to another SUPboarder review. This time we’re going to be looking at definitely the most groundbreaking inflatable sup that we’re going to see in 2019. This is the Red Paddle Co Compact 9’6″. 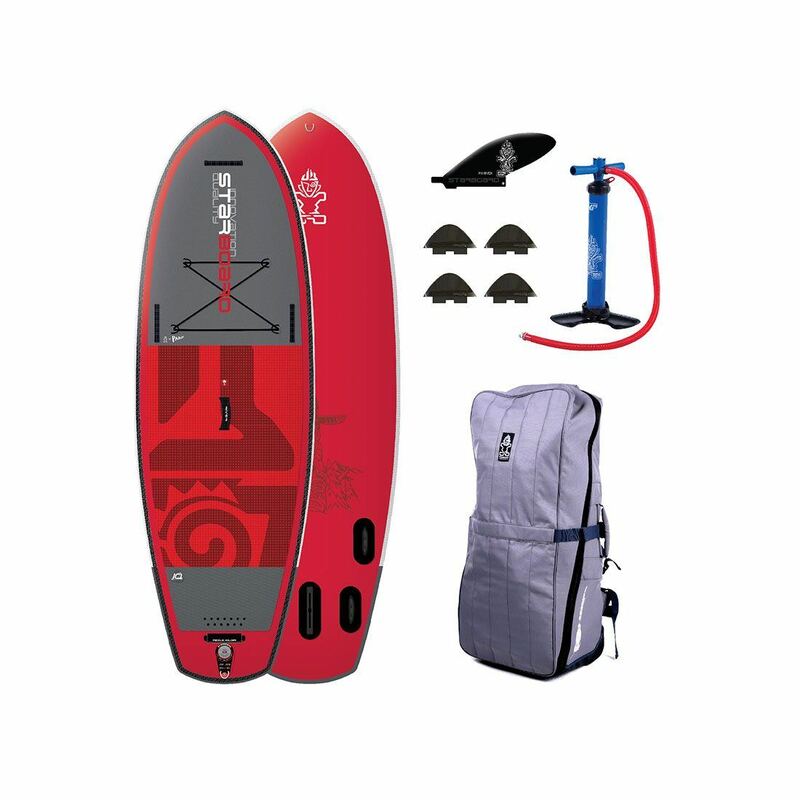 This is a full size up that folds down to half the size of a conventional paddle board, so it’s a super compact board hence the name, the Red Paddle Compact. In this review we’re going to go over all the facts about the new Compact and we’re also going to give it a little bit of a comparison to the Red Paddle Co Ride 10’6″, as well and we’ve also got Will from SUPboarder coming in, who is a super keen adventure paddler who took the Compact away on a little mini adventure, with a 10’6″ Red Paddle Co Ride. He’s going to give us his opinion of what the Red Paddle Co Compact is really all about. So we’ll warn you, this review is going to be a little bit longer than our standard video reviews, but then this isn’t really a standard board, it’s a completely new concept in design from the market leaders in iSUP, Red Paddle Co, and they have designed this board as a no compromise board. 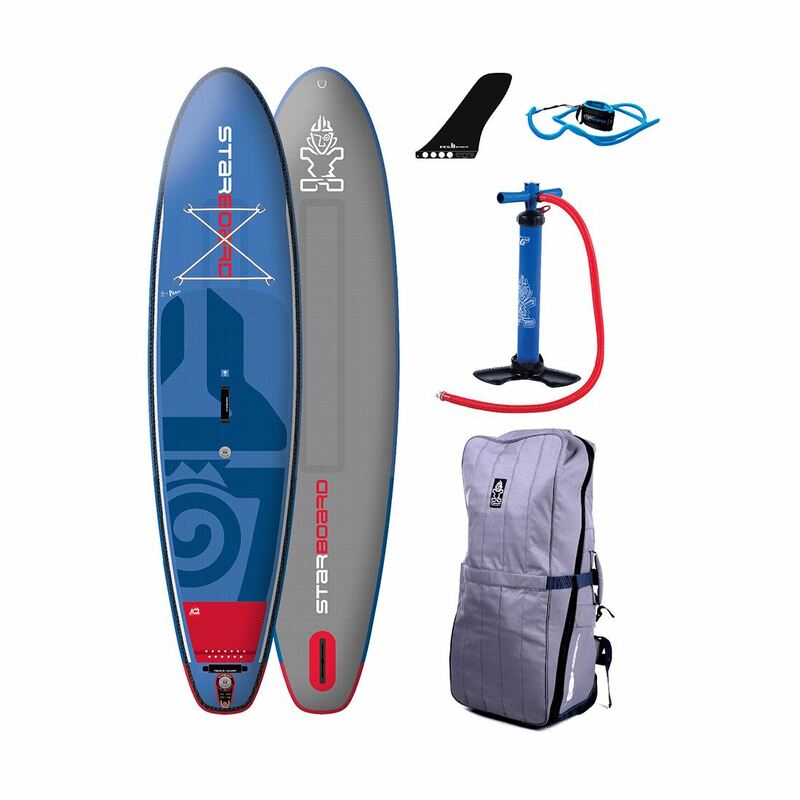 So this board should do everything an equivalent, maybe Red Paddle Co Ride 10’6″ should do, but better, and that is what we’re going to be looking at in this review. 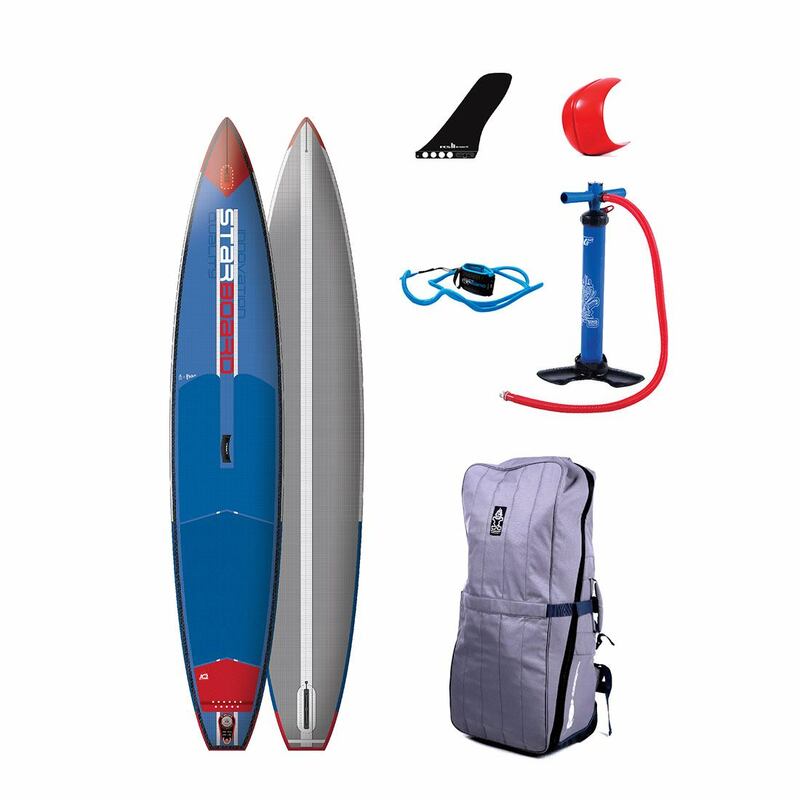 So talking about the specifications of the new Red Paddle Co Compact it’s 9’6″ long, it’s 32″ wide and it’s 4.7″ thick. The volume is 222 liters and it weighs 8kg (17.6lbs) which is incredibly light for a Red Paddle Co board the equivalent Ride Red Paddle Co 10’6″ is 9.9kg (21.8lbs), so it’s almost 2kg (4.4lbs) lighter straightaway. 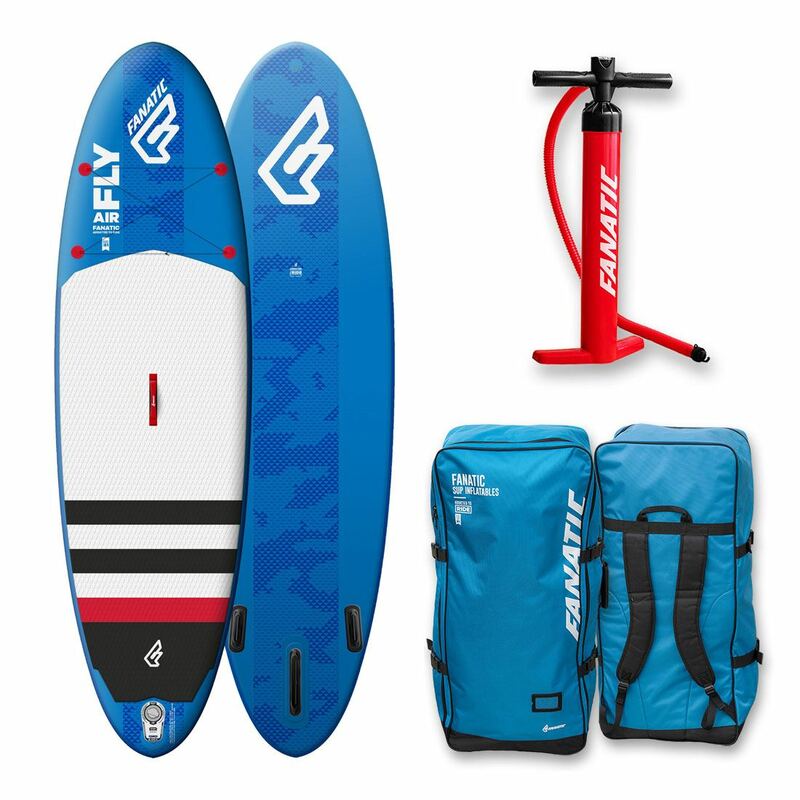 The full package weight with the paddle, pump and bag, only weighs 12.7kg (28lbs), so it’s fairly lightweight to get whole board in your back and it retails at £1299, 1499€ or $1899US. So you might have heard of Red Paddle Co talking about this board with 10 years in the making. All of their experience of making iSUPs, well over 10 years now, going into this board and that is true without a doubt. You’ve still got the Red Paddle Co super high-quality as you get with all the Red Paddle Co boards, but there is so much in this board that you do not find in any other Red Paddle board in the range. So the internal core is made of drop stitch, but this isn’t a normal drop stitch fabric, this is an extra high-resolution thread matrix drop stitch, which for a start sounds epic, but it also means the board stays much more rigid with its shape. This board, like other Red Paddle Co boards, has the MSL outer coating but this is a PACT Technology MSL coating which basically means it’s way more malleable than the other MSL technology they put on their board. Which means then, when you come to roll or fold your board, it’s much easier to do that. Then what’s finished on the outer layer is the quad stringer as you’ve heard about. Which from the top and the bottom of the board. The real important thing to notice about this, is they have placed them exactly where you put your feet so when you’re standing on the board they give you as much rigidity as possible. Because of all that, when we put this board in our deflection test and we compared it to the deflection of a Red Paddle Co Ride, there was barely anything in it, we’re talking about millimetre or millimetre and a half difference between the Compact and the standard 10’6″. Which remember, is over a kg (2.2lbs) almost 2kg (4.4lbs) in weight, so it’s got a lot more material over that complete board, so this new construction with the quad stringers really makes a difference and the board is very, very stiff and on the water it’s barely noticeable, if there’s any difference at all, but we’ll be talking more about the board on the water and the feel of it later on. Keeping a look at the top of the board, you’ve got a really comfy carry handle, the neat thing about this is it’s offset because they can’t put it directly down the middle of the board because when you fold the board in half, the carry handle would be in the way. Now this is fantastic for people who have got slightly shorter arms or longer arms because you can actually hold it this way up or you can come down from the shorter side and hold the handle. That’s a great little feature that and I’ve paddled with many people who wished they’ve had handles slightly offset from the centre line. Looking at the deck pad, you’ve got two sections of your deck pad, you’ve got your left and your right, because again they’ve got to fold the board in half. Now some people might think this might be a bit of a hindrance because you haven’t got any deck pad in the center of the board, but actually I’m going to reverse that and actually say it is actually a great help because it gives you a really good understanding or where your feet are on the board even if you’re wearing wetsuit boots. There’s still a different diamond grip deck pad at the and the board here which is great for feeling when you want to do your step-back turns. And up at the front of the board bungee straps that you’ll find on other Red Paddle Cos, but you’ll also notice how they’ve brought them in a tiny bit so they sit completely over the quad stringers. Again a neat little feature really ties it all in and makes it look really smart. The pressure valve and leashing point are both at the back of the board like your normal boards would, but they’re shifted and pushed over to the side so when you fold the board up they don’t get in the way. So turning the board over, you can see some standout things that make it look very different from a standard Red Paddle Co. To start, you’ve got your stringers on the bottom of the board, which remember, are directly below the top stringers which make the board nice and stiff, and also instead of having three iFins that you’d have on your traditional Red Paddle Co 10’6″s,9’8″, 10’8″, you have a twin fin system, so you’ve got two fins here. Now without a doubt Red Paddle Co have put a lot of effort into these back fins for helping the board go in a straight line and ease of paddling, which we’re going to be talking about with Will later on. But definitely by putting two fins in here and making the fins nice and wide and very swept back towards the back of the board, they’re further back than normal than you would find on a normal 10’6″, that gives the board much more straight-line tracking, makes it way easier to paddle in a straight line. 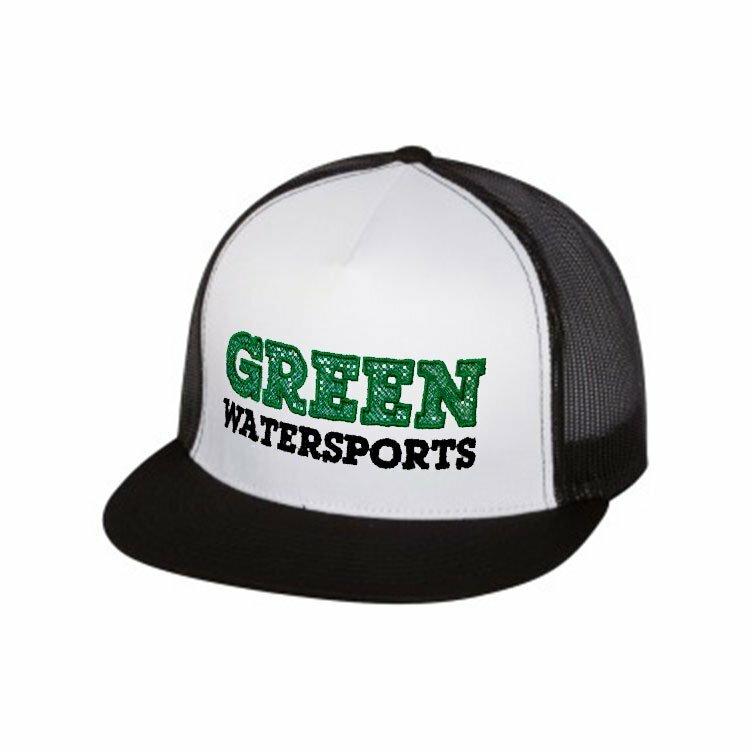 But they’re still very durable, they’ve got a bit of flex to them so they’re going to take the knocks up the beach, they’re a very simple easy clicking fin system to use it doesn’t take any time at all to set up and get on the water. Red Paddle Co have done a really great thing with this fin setup and it really does make a difference to the board’s tracking and performance. So as I said earlier, complete this bag with the board and all of the stuff you need to go paddle boarding weighs 12.7kg (28lbs) which is not that heavy. Couple that with a smaller bag, half the size of the standard Red Paddle Co backpack, makes it so easy to carry and put on your back. But it’s definitely not just the size of the backpack Red Paddle Co have been working on, they’ve really been concentrating a lot of effort on the shoulder straps, making them really nicely padded, the back area is incredibly padded with breathing area, so you won’t get a hot sweaty back and there’s lumbar support here which you can change and un-velcro to adjust the height difference, so if you’re a smaller person or a bigger person, you can adjust that to suit you. It’s still made of it’s very heavy-duty sort of ripstop finish that you find on the other Red Paddle Co bags, the handles are padded, really fat and incredibly well sewn into the bag, so you’re never going to be ripping those off of the bag. But really for me, the inside of the bag is what I really love. Opening the bag out, you can see that what fits in there is the biggest pump on the market the Red Paddle Co Titan Pump. So we take the pump out, we’ll talk about that in a second. You also get your leash as standard with the package, and at the back of the bag there, you’ll find the five piece paddle fits in nicely, all in it’s sort of pre labeled sections. Also you’ve got a nice carry pouch at the front of the bag there which you can put your fins in and keep your allen key there for doing your fins up. This backpack hasn’t got any wheels like the other Red Paddle Co backpacks, which I really think is a good thing because this is a lightweight comfortable walking backpack and you do not need wheels on a backpack like that. So having a quick look at the Red Paddle Co Titan Pump. If you’re familiar with this, you’ll know this is the world leading inflatable pump that you get with all of the Red Paddle Co boards. It is the first twin chamber pump on the market, it’s got a large chamber and a slightly smaller chamber. You start pumping using both chambers on the downstroke and then when the pumping gets hard and a little bit more effort builds up in your arms, you can switch the lever at the back and just pump on the skinny chamber, which means it’s really easy to get a lot of air in your board and get up to a high pressure, especially a board of this size. And also a good point to note there is the Red Paddle Co Compact is designed to take exactly the same amount of air pressure as any other Red Paddle Co board, so from 15 to 25 psi but really 18 to 25 is a really good range to go paddling. So having a look at the five piece Compact paddle you get with the package, this is a high modulus carbon paddle, so it’s a carbon shaft with a nylon blade making it really hard wearing, means you have no worries about it if you’re getting out of docks or rivers or key sides, the paddle blade is really tough. And also this is laser etched on the front of the blade here so any scratching the sticker won’t come off, it is in and on the panel blade. This paddle is so easy to put together, you take the sections, you cannot get them in the wrong place, they have a push-pin, push them in, lock that section in, take another one, push pin, lock that section in and so on. Very easy, very simple and your top system is finished off with the leverlock a slightly shorter leverlock than standard. The leverlock, that’s got a lever in the top there un-pull and a stainless rod down the middle to a rubber washer. Fantastic system, idiot-proof and extremely stiff. Doesn’t twist. A very good paddle to come with a package like this. We talk about the paddle again a bit later on with will. So we were both really interested to test this board when it came out because we saw the concept earlier on we both really liked it, but you especially Will you sort of from a sort of totally different angle, what angle did you see it and why are you really interested to get a go on this board? You know as you say the the design is really innovative, it’s completely new, but the main thing that I got quite excited about was the compactness of the Compact, and how that could be applied and the benefits that it would give to SUP touring and adventure and the possibilities of what what you could do with it. Yeah because you do a lot of touring and a lot of your touring is on inflatable SUPs isn’t it. Yeah, yeah because obviously if you want to travel somewhere on a plane an inflatable SUP is often the best thing to use so having it more compact and have the ability to put something on your back, which is a lot smaller, was really appealing. So how did you test this board, what do you feel you have to do to really understand if the compact did what you think it might have done? So I really like going and finding new places to paddle, bit quirky places to paddle. Off the beaten track. Yeah absolutely, so what I wanted to do is, is take the Compact on a little mini adventure and test out how portable it was in terms of walking with it and transporting it in a vehicle and then and paddling it in a location, get a feel for how it performed on the water, which is actually one of the most important things, and just get a feel for it that way. So we took the the board alongside a 10’6″ Ride from Red Paddle Co, and took both boards in a car, small car, to test out portability of the product, and then on a two-mile hike with them on the backs, before paddling on an old quarry to see how it performed. So the Compact backpack is obviously smaller than the 10’6″ or the current Red Paddle Co backpack, and it’s obviously going to be lighter, but the big thing that I noticed in the first look review is the features and fittings on the backpack look way more designed for walking, for actually using it. So how was that when you actually took that on that two-mile walk compared to the 10’6″ backpack as well. The bag as you say, there’s some really great design features on it and they performed really well. Lumbar supports and bits of padding here and there, and the straps were really good. The board’s much lighter, the bags very light, so on your back it feels very light. That’s obviously much easier to walk with. But the compact size of it as well, made it really, really good because whereas the 10’6″ board is very long and you bash your legs on it, there’s actually quite a lot more windage on the bag when I thought about it. The Compact is, fits onto you really nicely, you can take the weight on your hips rather than it all pulling off your neck. You can be walk for long distances. It’s all much much nicer to use and actually what it started to make me realize is, that you know you can really use this backpack and really travel with it, just having a backpack that your board fits into you can actually, can simply just take this wherever you want. Yeah, so it’s almost like the Red Paddle Co original or the still the existing backpack, is a backpack to transport your SUP which is great and you can carry it, but the Compact backpack is a better backpack you’d actually take on a distance go somewhere properly with it. Absolutely, yeah, it’s in that sense it’s a complete game changer because it means straight away I’m thinking I could do a lot with this board I can, it would mean going on city breaks would be a lot easier, small trips here and there just because the whole package is so much more transportable. Wow okay, so moving on to the board itself then, let’s talk about getting it ready inflating it, especially compared to on a standard 10’6″ or a 9’8″ or 10’8″ whatever, how was the inflation side of it? It’s really easy to pump up. It’s a bit smaller volume and so that means that it’s a bit quicker to pump up, and you’ve got a Titan pump which is a really fast pump to use so yeah, no real problems really. Obviously you have to fit the fins which is another little task to do but the system is really well designed, well engineered and it was just as fast, if not faster to pump up than the Ride. And then moving on to the paddle, clicking in the paddle together. That’s a neat system. It’s amazing either get a paddle to fit in that bag anyway. Yeah, my first doubts around it was is this paddle going to be stiff enough? It was, it was more than capable of doing what it needed to do and very light, nice blade shape. Yeah and definitely the blade is a little bit smaller than last year’s paddles and it’s great for that sort of just general paddling, average paddlers. I mean, if you’re going on a city break, you might try and go a little bit further and the smaller blade size is slightly better. Because it’s basically, okay it’s a five piece version, but it’s still a carbon nylon which was one we reviewed last year and it was the best, one of the best winning paddles on test wasn’t it. So carbon shaft is a really good combination. Now we’ve both paddled this board, and we both paddled it compared to the 10’6″. We’ve obviously paddled the 10’6″ for many, many years before, it’s a very well known board from Red Paddle Co. It was really interesting to get on this because Red kept on saying it’s going to paddle as good as a 10’6″ and yeah you’re losing a lot of the length and obviously a foot off the nose of your board, off the full water line length will make a difference to the tracking, but they’ve done a lot of work on the fins and to make it go in a straight line and have to say for me it absolutely goes in a straight line, and I’ll even say I think it goes in a straight line better than the 10’6″. Only marginal, but I really think it’s a good performing board, is equally as good as the 10’6″. Yeah, I mean I was a little bit dubious about how well it would to go in a straight line but I tested it alongside the Red Paddle Co Ride 10’6″ and I couldn’t really notice a difference, I probably err to what you said in terms of maybe it was a little bit better. Yeah I kept questioning it, I kept thinking it can’t be, but actually I do think it is a little bit better. The other thing to note is when you’re paddling, it’s notably lighter on the water isn’t it? Yeah it feels much more lively and just because of that light weight, you can do cross bow turns on it nicely because it’s a little bit more compact and just generally much more agile. Yeah it definitely feels a little more lively underfoot, more reactive, but still paddles in the straight line. I’d say it’s easier to paddle this faster than a 10’6″, so that’s coming in to glide length as well. So really happy with how it paddles on the water. Talking about stability of the board, so this is 32″ which is the magic width of all sort of average boards. It’s just a stable rocking side to side as a 10’6″, and if you’re getting into your step-back turns. And just I know that we’re going to get some questions about it, could you take this in the surf? Absolutely, yeah, I mean I think the two back fins would do quite a nice job. Yeah we haven’t used in the surf, but I’d see no reason why this wouldn’t surf as good if not better than a 10’6″. Yes the fins are slightly more swept back which make you go in a straight line, but you know you’re surfing a iSUP of this size, you’re just going to be trimming down the line having fun aren’t you, so definitely you could take this in the surf as well to save those questions we’re going to get. From the stiffness point of view if you’re comparing it to 10’6″, I did not notice anything really on the water, maybe you know notice a slight bit more with the 10’6″ because it’s longer, as far as the board itself, I didn’t notice anything different really on the water I couldn’t notice anything. You know its structure felt really stable and I think it probably comes down to them putting the stiffening where it needs to be put on the design. A lot in this board, a lot and I think – I think it’s fair to say in general paddling it does exactly what they say. What would be the limitations with this board? 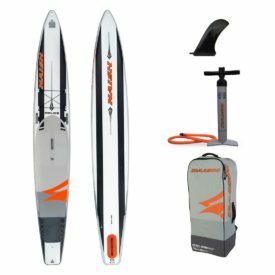 This board would be a really great platform to get into a SUP touring and SUP adventuring. And its length is going to be a bit of a limiting factor because it’s going to have less glide than say it 12′ or 14′ touring board and however, it’s very portable, it’s very small, so there’s a way of getting into that, it’s fantastic. What it’s got going for it is that particularly the tie-down bungees nice and big a board of this size often you might just see a tiny little area to tie something down, but you could get a decent size, a hundred liter dry bag under there no problems, and quite easily go on an overnight trip. That’s true, so more than just putting your flip-flops on the front, you can actually put stuff on this board. 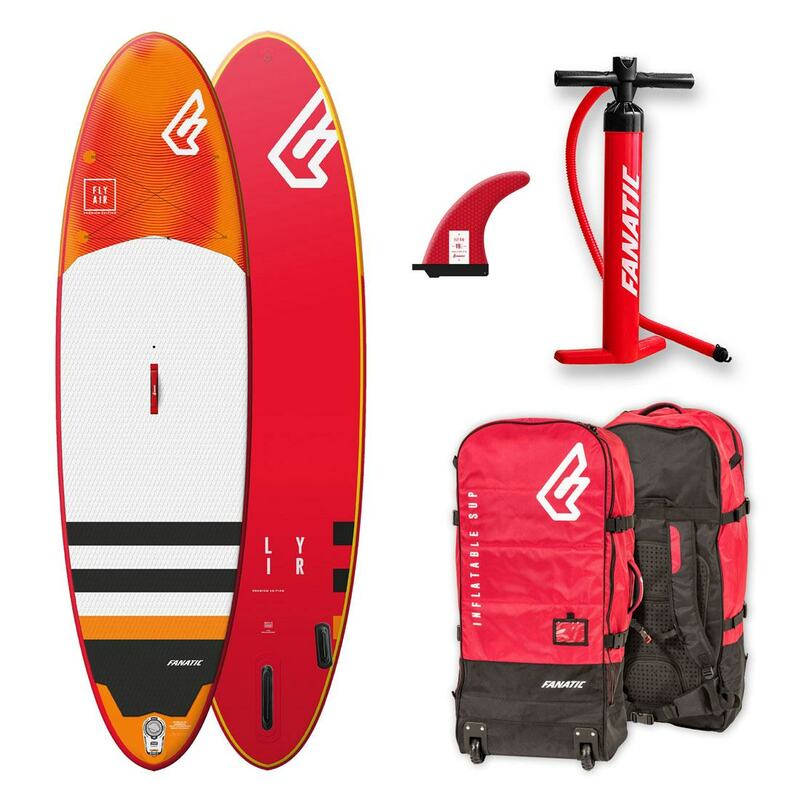 You’ve got loads of space and a nice solid elastic as well and yeah fantastic well-thought-out as a first adventure board and the compact nature of the board and the bag make that really, really feasible. So like all adventures they all come to an end and the deflation and packing up of the Red Paddle Co Compact, because it is different to a standard Red Paddle board or any inflatable board on the market isn’t it, how did you find it was different and what pros and cons did you find to the process you have to do? It is a bit different, it’s not necessarily harder once you learn how to do it. You need to get all the air out before you fold it in half, to then roll it around the pump, and if you don’t do that, it can be a little bit tricky, but having packed it down a few times now I’ve learned how to do it and it’s fine. You just need to maybe roll it up in the standard format without folding in half to get rid of the air, quickly unroll it, fold it in half, wrap it around the pump. Right, so it’s just a case of like two sessions and you’ve already learnt the new process. Yeah it’s just a bit different, but yeah, you know this is a groundbreaking technology for inflatable SUPs so it’s going to be a little bit different in the way you use it. And although the process is a little bit more tricky, what you find is that once you’ve rolled it all up around the pump, it’s just one package that you put into the bag and zip the bag up which has already got the paddle in its nice sections, you’re putting into the package Titan pump, which is a large pump, which means it puts air into a board quickly and, but it’s not the most transports will pump out there, but in this package, if it becomes the most transportable packages. That’s a very good point yeah. So who do we think the Red Paddle Co will best suit. 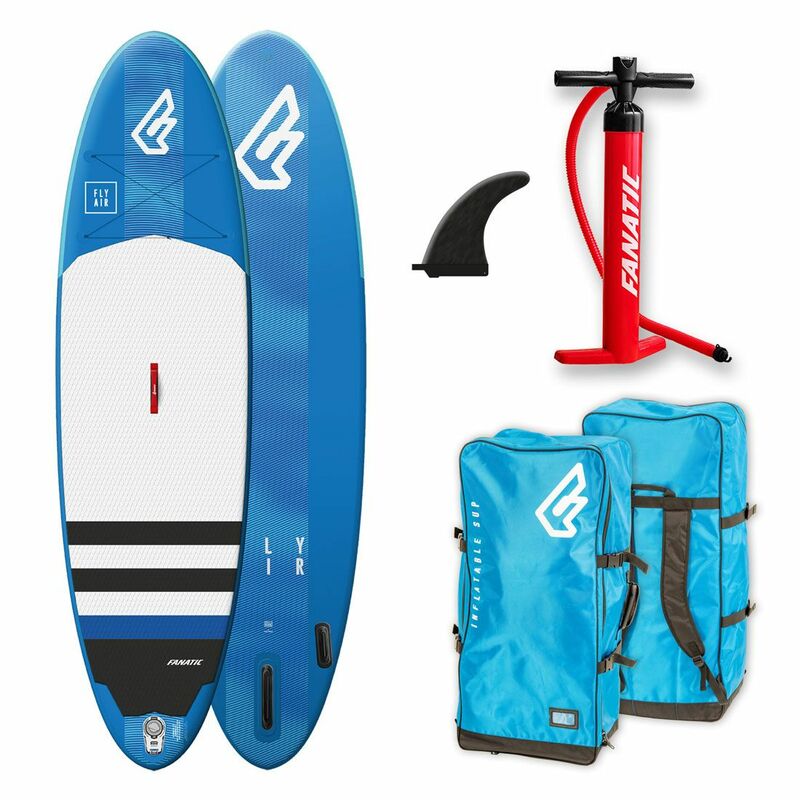 Well it’s going to be great for a beginner getting into the sport, but really it’s also going to be good for those people have been paddle boarding a few years, because they’re going to have a board that can go in a tiny bag and go places. Yeah absolutely I think it’s really interesting, you can, I’d quite like to have one of these and you know you could put it on the boat, you can transport it easily, you could go and keep it in the car all the time, just in case you want to go paddling somewhere. You can put it on the back of a bike, you could put it on your back and go skateboarding to your SUP spot, the opportunities are endless and actually it opens up loads of potential and it’s a very exciting concept. So to conclude with pros and cons and value for money. Pros, well there’s probably quite a few pros to this board. Yeah, I mean, where do you start. It’s really good, it does everything that your normal 10’6″ inflatable would do, yeah, but the compact nature of it when it’s packed down and gives you loads of more opportunities of what you can do if you’ve short on space for storage, you can store it easily, but you can also take it more places. And I think for me is the weight. Yeah 8kg (17.6lbs), it’s light isn’t it. Yeah it is quite astounding how different that much that weight saving makes when you’re holding the boards. Yeah don’t get us wrong, other brands make lightweight boards but this is a Red Paddle Co just bear in mind, so the quality is completely up there and it’s 8kg (17.6lbs) and it goes in the bag. So for us it’s like, alright, this is a whole different ball game from Red Paddle Co. Cons, any negatives you’ve got that you want to bring towards it? I mean we talked a little bit about the deflating process. I don’t really think it’s a con, it’s just something to be aware of. On the bag, it is obviously very good, well-thought-out, it could do with a chest strap just to give you another option of fitting that backpack to you to really well and that’s you know, it’s just an improvement. Or it’s probably a con because you’re walking further than you’ve ever done before with it. The backpack’s really good but it would be nice to see that feature on it. So value for money £1300, 1500€ or $1900. It’s an expensive iSUP, is it worth it? I think it is. You get so much for your money in this, don’t forget you get a carbon nylon paddle which performs really well. They’re the things I forget, the paddle, the pump, backpack, comes with a leash, a great bag and you know the board’s really packed full of innovation and technology and it will do more. 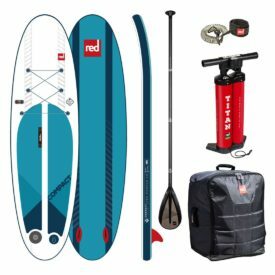 So it is the same price as other top-end iSUPs but you get the paddle, you get the top-end Titan pump and you get the backpack that nobody has ever seen, and it’s the smallest board on the market, so actually it probably is very good value for the price point, and there’s nothing else on the market that can touch it. Yeah, I think that’s a really important point to make, it does something that nothing else out there will do in terms of the the portability the performance, its compact nature, nothing else out there is really ticking all the performance boxes as well as the compact and lightweight. Yeah so definitely with some things, other things suffer, but with this board nothing seems to suffer does it? No. So really hope you found that SUPboarder review interesting and informative. It’s been great to have Will in here on this one. 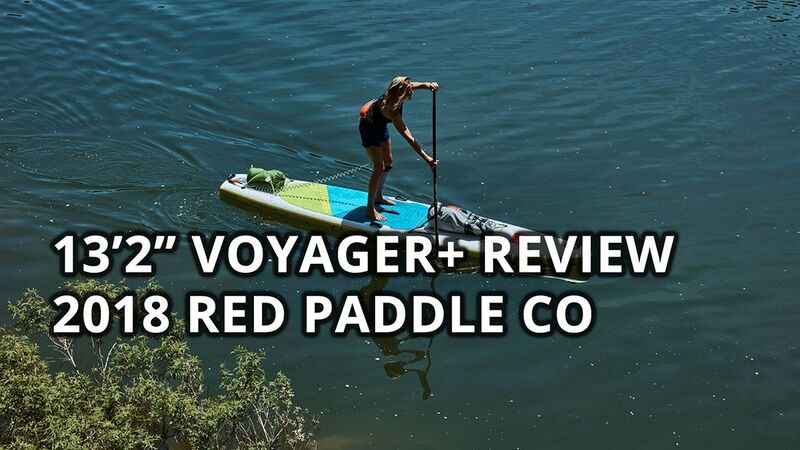 Definitely the Red Paddle Co Compact has been great for us to review. We’ve been very excited to see this and just for the R&D, the technology Red Paddle Co are putting into this, it’s great for iSUPs in general isn’t it, really pushing the boundaries and changing the normal structure of how an iSUP should look. Yeah I think it’s fantastic innovation, it’s fantastic to see. Everybody is making iSUPs in the same way, Red Paddle Co have proved that they are market leaders by pumping a load of time, and I imagine money, into developing this new technology that has the potential to completely change the way we think about iSUPs going forward. Personally I’m really excited to see where it goes and the way that we can have more portable iSUPs. Removing some of those barriers to using an iSUP, which is often around the size it is on your back, that can open it up to some really interesting adventures and challenges and walking to remote paddle locations, some really incredible paddle locations, so really well done from Red Paddle Co for pulling something together that is going to start to allow us to do those type of things, it’s going to let our sport go to new levels. Posted on January 29, 2019 by Julian Kidd.